The Enchanted Market runs over two days - Saturday 16 and Sunday 17 February. 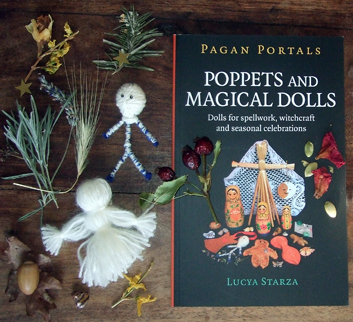 it is a fabulous pagan festival with magical market stalls selling a huge range of pagan and spiritual goods, books, clothing other goodies. 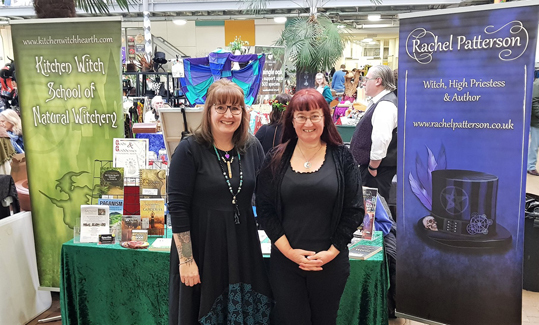 There is also live music all day and into the evening as well as workshops, thought-provoking speakers, healers, tarot and angel readers. This year a Goddess Temple is offering healing and meditations, and every year there are fun and games in Steampunk Alley. Several of my fellow Moon Books authors will also be giving talks and workshops, including Cat Treadwell, Rachel Patterson, Flavia Kate Peters and Barbara Margaret Meiklejohn-Free. I will be bringing copies of my books along for people to buy on the Saturday. The photo at the top shows me with Rachel Patterson at her stall at The Enchanted Market last year, the bottom photo shows my book Pagan Portals - Poppets and Magical Dolls.